Black onyx, Montana agate, ammonite, onyx, palm wood, Poppy jasper, Petoskey stone, onyx, carnelian, and Llanite. 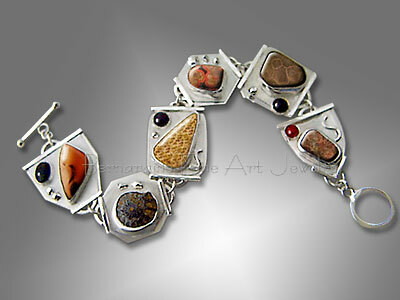 This link bracelet of sterling silver is a one of a kind design. The cabochons were individually hand cut to fit the design. The top layer of silver in this bracelet is textured and the bottom layer is polished to a mirror finish. This helps to camouflage mars and scratches.